Welcome back to yet another installment of The Eternal Spotlight. I'm your host, Islandswamp, and I'm here to talk about some strange decks I've been playing around with. These two decks have a few things in common. They both are a blast to play, and they both play an industrious little fellow called Goblin Welder. How did I end up playing these decks? Well, there are plenty of decks in Vintage that one could play that are not Delver, Martello Shops, or some Mentor concoction. On one hand, I like to win, so often times I'll just try to play whatever is considered to be the best deck at that moment. On the other hand, I do enjoy playing some decks more than others. Losing isn't any fun though, so if I'm going to play something that isn't one of the top dogs (Delver, Shops, Mentor), than the deck has to have some serious game. When I look at the top Vintage players, I've noticed that a lot of those truly adept Vintage mages can pilot just about anything as long as they've tuned it well enough. For example, looking through the D.E. results on mtggoldfish, The Atog Lord has cashed Dailies with everything from Shops decks all the way down to The Perfect Storm. It takes a truly skilled player to be able to pick up any random deck and do well with it. I once wrote an article about becoming an expert on one archetype. In that article, I elaborated on my theory that mastering one particular deck in any given format will yield improved results. I still think it's a good idea to completely master at least one deck, but "playing the field" can gain a person a lot of valuable knowledge. I, for instance, gained a ton of experience playing Martello Shops for a few weeks. I don't beat the deck every time I face it, but I'm certainly more confident when I do. This deck is based off of lists I found while scouring The Mana Drain. Upon doing further research, I found other people's lists, and even at least one article by Bob Huang of CFB. While this isn't a deck that is commonly played anymore, I've found it to be very powerful and a ton of fun to play. 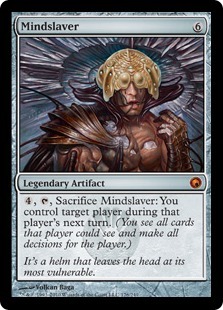 Control Slaver is a deck that has its roots in Mirrodin, when Mindslaver was first printed. Back then, "Stax" decks were of the poly-chromatic variety. Control Slaver, while having some similar cards like Goblin Welder, had many differences and was very much its own animal. Rich Shay has written a primer that, while outdated, still contains a lot of useful info (including some history of the Control Slaver archetype). 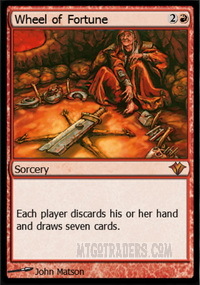 In the beginning, that is to say when Mirrodin was first released, Control Slaver decks ran the full play-set of four Goblin Welders. The deck was a control/combo hybrid that would spend the early game attempting to hold control of the board-state and neutralize any potentially damaging plays from the opponent. At the appropriate juncture, Control Slaver would shift gears into "combo mode" and use cards like Mindslaver in conjunction with Goblin Welder to win the game. With a strong Counterspell suite of Mana Drains and Force of Wills, Control Slaver had an early game that could hold its own with most decks in the field. 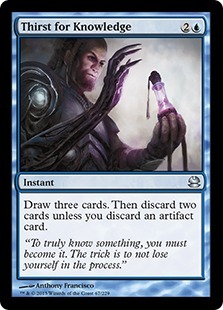 A then un-restricted Thirst For Knowledge provided the draw engine for Control Slaver, all the while filling the graveyard with potent artifacts to be recurred with Goblin Welder. Since the time of Control Slaver's heyday, Vintage has evolved and the restricted list has changed. 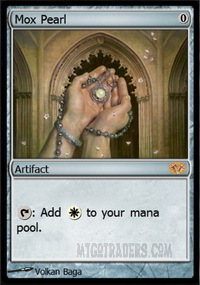 Thirst For Knowledge is now restricted to one copy per deck, and the abundance of tempo decks in the format have prompted many players to include more spot removal in their lists. Goblin Welder now has to contend with both Mental Misstep and Lightning Bolt. Both cards are highly-played main-deck answers to Welder, and to top it off, pitching artifacts to weld into play is a lot harder with only one Thirst For Knowledge, All of these factors have conspired to make Goblin Welder seem like an unattractive option in deck construction. When Conspiracy and Vintage Masters were released, the sets brought with them Dack Fayden - the greatest thief in the multiverse. 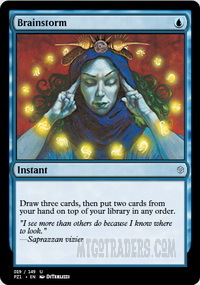 The innocuous-at-first-glance planeswalker made an enormous impact in tournament Magic, if only in the King of formats. Vintage decks are rife with choice artifacts to steal, from the restricted jewelry to the behemoth artifact-beasts of Martello Shops and Tinker decks. When he's not thieving some wondrous treasure for his master, Dack's loot ability is well-known for its ability to allow players to sculpt game-winning hands. Players familiar with the Control Slaver archetype suddenly realized that the new planeswalker might yet breathe some life into the classic archetype. While Dack doesn't do exactly what Thirst did for Control Slaver, his loot ability offers fantastic card-selection while simultaneously providing welding fodder. 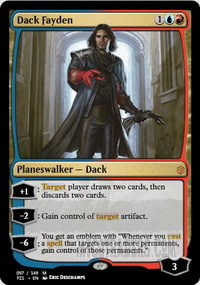 Add to this the ability to further improve the Shops match-up and you can see why Dack is such a well-positioned planeswalker. 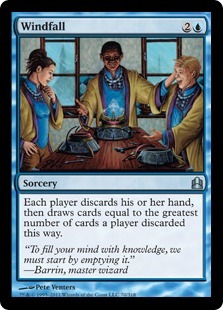 Lacking four copies of Thirst for Knowledge as a draw engine, Night's Whisper was incorporated into the Control Slaver shell. This updated build of the classic archetype is what came to be known as NWCS, Night's Whisper Control Slaver. Night's Whisper is a card that might raise a few eyebrows. 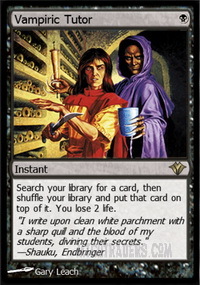 The black sorcery seems at first glance to be too weak for competitive Vintage. 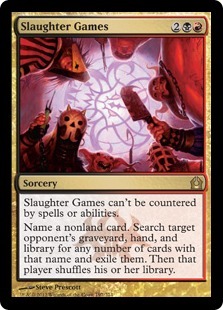 After all, the card bears a striking resemblance to Sign in Blood, a card that sees little to no tournament play even in Standard or Modern. Better players than I have made the assertion that in this deck Night's Whisper is better than Dark Confidant would be in its place. 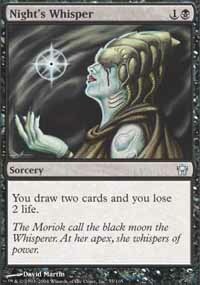 Night's Whisper provides much needed card-draw at the same converted mana cost, and the cards are drawn immediately. The same factors that make Goblin Welder fragile in today's metagame also apply to Dark Confidant (which is why it's no coincidence that Dark Confidant is also on the decline). 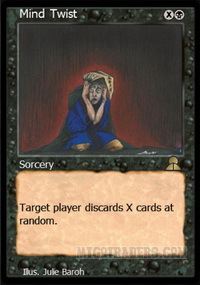 Dark Confidant also takes two turn cycles to provide the same number of cards that Night's Whisper provides and likely costs its controller more life. If NWCS was more interested in attacking with a (Grizzly Bear) each turn, then I'm sure that Bob would be the better inclusion. This simply is not that type of deck. The main drawbacks with Night's Whisper are the fact that it's both black and a sorcery. I'd much rather be casting draw-spells during my opponent's end-step and keeping Mana Drain mana open at all times. The fact that it's black is a real issue as well. 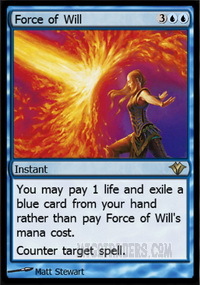 NWCS plays a smaller number of blue cards than I'm used to, and having a blue card to pitch to a Force of Will can be a real pain sometimes. Other than that though, Night's Whisper is really efficient. 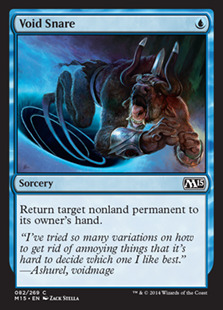 It isn't "free" like Gush, but the tempo-loss of tapping two lands is less than that of returning them to your hand. 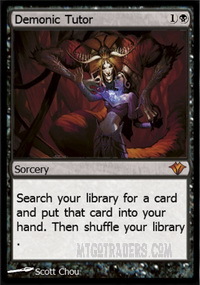 I don't believe that the deck could support a full play-set of delve draw-spells, otherwise Dig Through Time and Treasure Cruise would make up the draw-engine. NWCS doesn't play all of the cantrips that Delver decks play and that limits how fast the deck reaches enough cards in the 'yard. Dig Through Time in particular is an insanely powerful card, and I could agree that not including it in this deck is a disadvantage. Contemporary Grixis Control decks are very similar to this build of NWCS. The key differences are that the Grixis decks are running the full load of Preordains and can support the delve draw-spells. Grixis also doesn't play Welder or Slaver, and it runs less artifact mana. Grixis does include the Key/Vault and Tinker/Colossus combo as well as Yawgmoth's Will. Grixis is by far more popular, and many would say that it's better suited for the metagame as well. I've played both decks, and I can only say for sure that I prefer playing with Mana Drains and Goblin Welders, so I enjoy NWCS much more. One more distinction I'd like to mention is that my list is playing the Key/Vault combo while many other builds have chosen to run Mindslaver. I haven't seen that many builds that are running both Slaver and Time Vault, and I can understand why. Perhaps I've built this deck incorrectly, but it's been very good in my test matches. I like that my version has several paths to victory. I can Tinker into a win-condition, be it a creature or a broken artifact, or I can just tutor for or draw one (whichever piece is more relevant). Mindslaver isn't as good against decks without broken cards, so I sideboard it out against many fair decks. My build of Control Slaver runs three Mana Drain and it is highly important to my strategy. 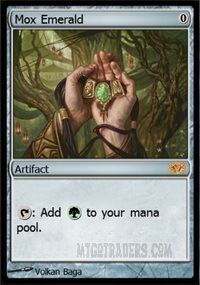 This deck makes terrific use of the abundance of mana that a Drain can provide. 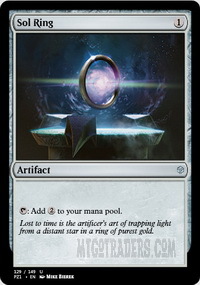 All of the artifact mana also comes in handy, and I've hard-cast my Tinker-targets a lot more than you'd think. 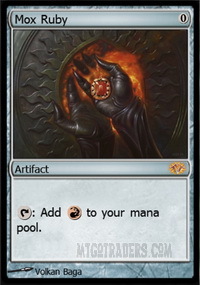 This is one little advantage to playing the extra artifact mana. 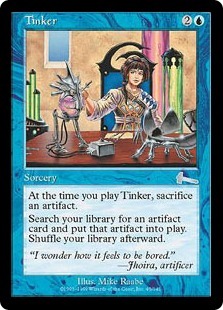 The Tinker targets are Myr Battlesphere, Time Vault or Voltaic Key, or even Mindslaver. Each one of the targets shines in certain match-ups or board-states. Myr Battlesphere has been much more powerful than I ever imagined. If the battle-ball gets stolen or destroyed, you're still left with the four tokens. 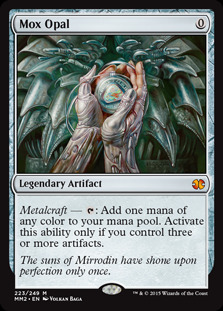 Four Myr tokens may not sound like much, but they can still be helpful. 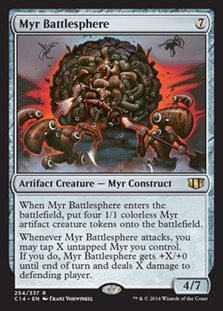 When it isn't being dealt with, Myr Battlesphere can hit for 12 damage (four of that damage is unblockable and comes from its triggered ability). Battlesphere also creates a sizable board-presence out of nowhere, and that can be instrumental in winning a game. The Vault/Key combo is pretty self-explanatory. If you can safely force-through a Tinker for the missing piece, this combo will essentially end the game on the spot. Mindslaver is a trickier card to evaluate. At minimum, it's an over-costed Time Walk. At best, Mindslaver will allow you to force your opponent to kill themselves. Most recently, I was playing the final game of a match against Oath. My opponent managed to resolve an Oath of Druids and was due to get Griselbrand the following turn. Since we had both used up all of our counters while the Oath attempted to resolve, I realized that I would likely be able to cast Tinker on my next turn (my opponent still had at least one unknown card in their hand). I Tinkered for Mindslaver after I noticed that my opponent was at exactly 14 life. I decided to let my opponent draw 14 cards with his Griselbrand so I could then go have lunch. The sideboard I've put together for my deck is largely based on cards I've seen in other similar builds. Some of the cards were chosen because I felt that they were good enough to at least test out. 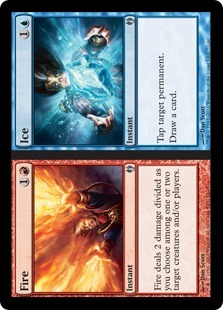 These two cards are the standard issue sideboard tech for Mishra's Workshop decks. 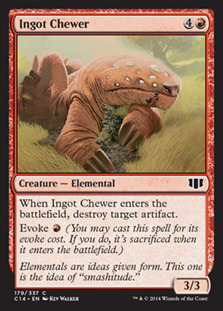 This deck has several cards that are already very potent against Shops, so the full play-set of Chewers was not needed. 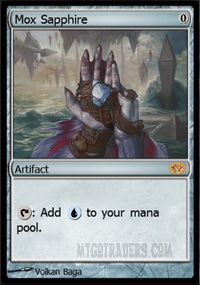 Anti-Dredge and anti-Oath. Don't forget, you can weld away a Cage if you need to weld a Battlesphere back into play. Just don't forget to weld the Cage back into play before you pass your next turn! Graveyard hate for the Dredge match-up. In a pinch you can recycle these to draw extra cards. 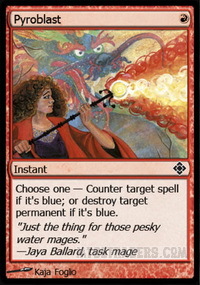 Very useful in neutralizing opposing delve-spells. 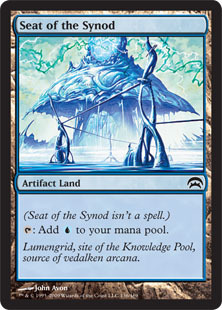 Standard anti-blue sideboard card. This should likely be a Red Elemental Blast, but the difference is minimal. This is my secondary Tinker-target for when I'm fearing a Dack Fayden. Very good against any deck that plays Islands, which is 70% or more of the Vintage metagame. I got the idea to play Massacre from the Mana Drain, and it has been awesome at sweeping the board against Monastery Mentor decks. Aggro/Tempo decks are a real headache for this deck, and Toxic Deluge is like a cheaper Damnation. It's easier to cast, and can take care of untargetable creatures. NWCS is somewhat soft to Oath of Druids, the deck doesn't have any way to destroy an enchantment, and it plays creatures that will set off an Oath trigger. I decided to try one Slaughter Games. I haven't actually used it yet, but in theory it should be devastating if cast early enough against certain decks. Some decks play a very small number of win-conditions, and the idea is to exile them asap. I haven't had enough testing to decide if this is a card I'd keep in the sideboard, but I think it has potential. Why should I play NWCS? First of all, NWCS is a deck that you should play if you want to have a good time welding things and making busted lines-of-play. If you want to play it safe, you should probably just play Delver. If Delver isn't your cup of tea, NWCS just might be for you. I don't find it as simple to play as some decks, but it has a lot of game. Goblin Welder is good against Shops decks, and your artifact mana isn't hosed by one of their best lock-pieces (Lodestone Golem). The Key/Vault combo is cheap to play, and cheap threats are important against Shops decks. Dack Fayden also gives Shops decks a hard time. Overall, I think the Shops match-up is decent at least. Against other decks, NWCS has Counterspells and the power of Yawgmoth's Will to steal games. While this deck doesn't have the enormous draw-engine of Delver, a clever pilot can earn plenty of wins with this list. There is also a ton of room to experiment with this deck. Notion Thief could be a great addition, as it combos with Dack Fayden nicely. I've even made the sketchy decision to try out a single Daretti, Scrap Savant in my current build. While Daretti is rather expensive, his first two loyalty abilities are highly relevant to the deck. 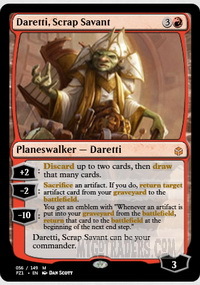 Being able to "weld" an artifact the turn that he comes into play makes Daretti a potential game-winner. The reality could also be that Daretti isn't worth the slot, but I enjoy the adventure of figuring that all out. I heard a soft whispering in the night, "The Mindslaver is coming for you!" The next deck that I've decided to share is Steel City Vault. 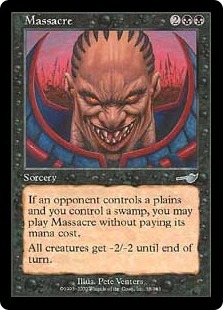 At first glance, SCV looks a lot like Control Slaver. Both decks have Goblin Welder, and SCV has the Time Vault combo just like my version of Night's Whisper Control Slaver. Upon closer examination, Steel City Vault is much different. Steel City Vault is an all-in combo deck, not a combo-control deck. Most decks in Vintage that some people consider to be combo decks are in fact control decks that happen to play with some infinite combo as their finisher. Steel City doesn't play that game. 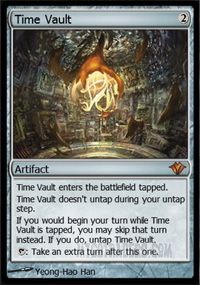 The point of Steel City Vault is to aggressively assemble the Voltaic Key/Time Vault combo. There are a few back up plans, one of which is to Tinker for a robot to finish the match, but in general this deck just dumps out its hand and tries to take infinite turns. 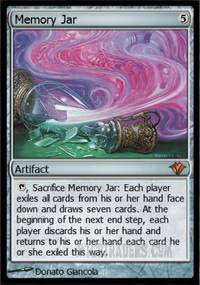 The deck is comprised of an abnormally-large amount of one-ofs, even for Vintage. Steel City Vault is a veritable who's-who of the Restricted List! I found this build of Steel City 2.0 in this article on Star City Games by Brian DeMars. This particular list was played by Paul Mastriano, and was an updated version of Brian's original Steel City Vault deck. Always the inquisitive type, I googled the hell out of the phrase "Steel City Vault" to find out all I could. As you can see, the two lists have a lot in common, but several key cards were printed in the time between 2009 and today. First of all, Mox Opal was printed, and that card is absolutely insane in a deck like this. 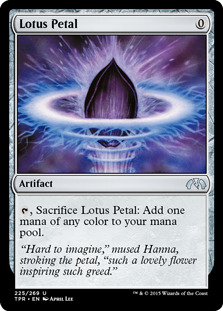 The latest incarnation of the "Legend Rule" enables superfluous copies of the legendary Mox to act as Lotus Petals, a card that's restricted in Vintage! Yawgmoth's Will has a lot to do with Lotus Petal being restricted, and with essentially five Petals in the deck, the potential for extraordinarily-explosive YawgWills is quite large. 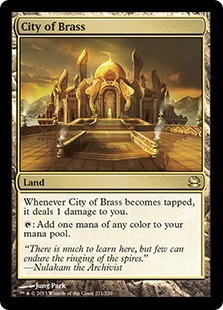 Other notable printings include Mana Confluence, which acts as extra copies of an improved City of Brass, and Flusterstorm. 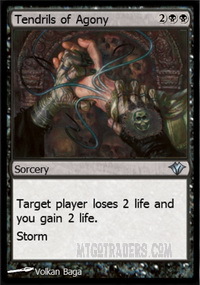 While Flusterstorm was not included in Paul Mastriano's version, I've decided to run the card in my list. In fact, the only change that I've made is that I've replaced the Misdirections with Flusterstorm. I simply do not own two Misdirections anymore, and at over 100 tickets each, it may be a while before I do. 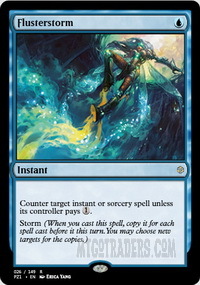 Flusterstorm can at least act as a cheap backup-counter, which is one of the jobs Misdirection is used for. I've also been thinking about finding room for one or two Defense Grids. Defense Grid is great in TPS decks, and I think that it could be really powerful here as well. Before I get too far into hypothetical future card-choices, I'd like to break down the deck into its parts and examine them. 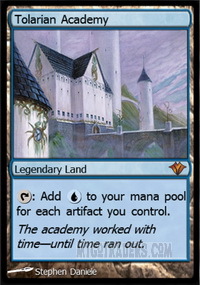 Steel City is made up of fast mana, card draw/tutors, some minimal disruption, and finally the combo pieces. SCV plays nearly every piece of restricted fast-mana available, as well as the unrestricted Mox Opal. These cards give the deck it's explosive mana production. 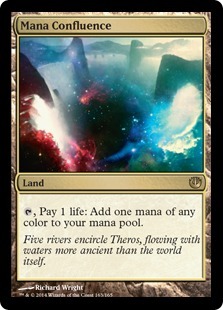 Six rainbow lands and four artifact Islands help the deck cast its spells, and the artifact land serves to power up Thoughtcast. All of these cards are powerful and efficient, and they're the nitro-methane that fuels this dragster of a deck. 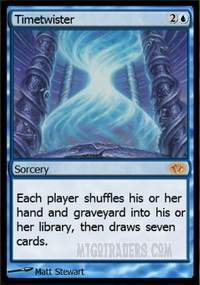 It's not uncommon to chain together five to ten spells in a turn with this much card-draw and fast-mana. Dack Fayden is commonly used for his looting ability, but he also qualifies as disruption in some match-ups. I absolutely wasn't kidding when I said that the deck plays minimal disruption. This is the disruption package that Paul Mastriano settled on, but I very well may adjust it to be more appropriate for the MTGO Vintage metagame. Notion Thief and Null Rod are popular enough online that it might be time to go back to the original deck's plan of running a main-deck Ancient Grudge. Pyroblast certainly wouldn't hurt either. 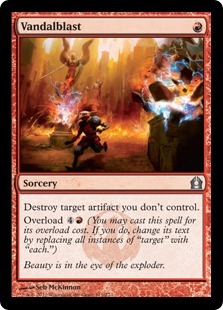 Blast is a great way to deal with Notion Thief as well as blue-based planeswalkers like Dack or Jace. The simplest two-card instant-win lottery ticket available in Vintage. 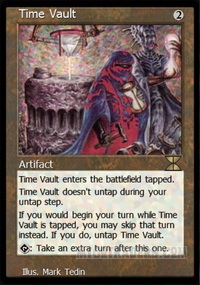 Sometimes playing this deck feels like pulling the lever on a slot machine, and Time Vault is the jackpot. Tinker can find either of these, and Goblin Welder can weld them back into play. Goblin Welder doesn't quite fit into any one category. The tricks that an active Welder can pull cross the boundaries from mana-production to disruption, and even into combo and tutor-like effects. 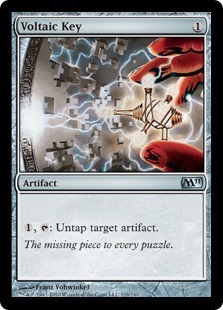 Discarding an artifact with Dack Fayden or Wheel of Fortune and welding it back into play is much like a tutor effect. 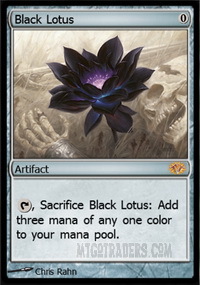 Swapping a Seat of the Synod for a Black Lotus yields a huge mana boost. And finally, disrupting a player by welding their Null Rod into anything else is the sweetest trick of all! These two cards are harder to classify, so I put them by themselves. 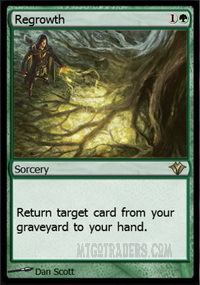 Regrowth acts as extra copies of restricted cards, combo protection, and even serves as disruption by recycling cards like Nature's Claim. Casting Time Walk is the classic tempo play, but in this deck it can also be part of the combo by granting "haste" to Goblin Welder. SCV contains several top-deck tutors, which makes Time Walk even more attractive. That said, Time Walk isn't really important to the overall strategy of the deck, so I don't mind pitching it to Force of Will. Here's the coolest spell to Burning Wish for. If "plan A" fails, it's quite easy to storm out with card-draw and wish for a Tendrils to win the game. Hurkyl's Recall is fantastic at building your storm count as well. 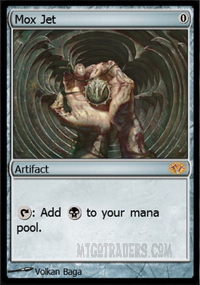 Simply bounce and replay all of your own Moxen. This is Tinker number two, and it's also a sorcery so you can wish for it. 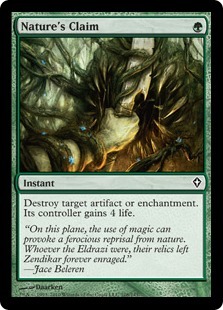 Interesting side note, this card inspired MaRo to create Tinker. Clearly Tinker is far more balanced (not really). Sorcery bounce spell. Perfectly serviceable and efficient. The wish-able Wheel of Fortune. Often times, Windfall is pretty bad. Luckily we never have to draw it unless it's going to be incredible at that moment. This deck produces a metric ton of mana, and Mind Twist is great at emptying someone's hand. Wish-able Mind Twist number two. 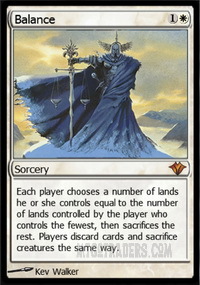 Balance also functions as a Wrath of God and perhaps Armageddon depending on the board-state. 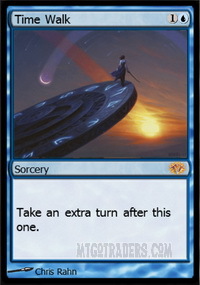 Balance has my vote for most ironic card title, as it is anything but balanced. I've had the nut-draw once where I emptied my hand, and cast Burning Wish to get and play Balance all on turn one. It doesn't happen often, but it was quite spectacular. Shatterstorming an opponent's artifacts is a great feeling. It's a sorcery, so it makes the cut. Artifact hate, specifically for (Null Rod). Ancient Grudge is great against Shops variants and nuking people's Rods. 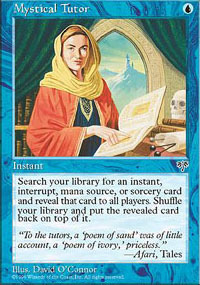 The final word in Counterspells, no Force of Will is safe when Flusterstorm is on-line. There you have it. Steel City Vault is an explosive combo deck that attempts to win by overwhelming the opponent with card-draw and mana production. This provides the fuel to find and assemble the combo. Goblin Welder, Yawgmoth's Will, Regrowth, and even (Time Twister) can bring back combo pieces from the graveyard, so getting them countered isn't the end of the world. Between the main deck and the wishboard there are too many dangerous cards for the opponent to be able to counter all of them. The key is to sequence your plays to make sure something important does resolve. 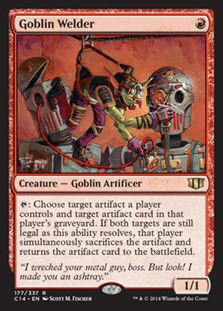 Even the innocent-looking 1/1 Goblin Welder needs to be answered immediately, and that puts a strain on other player's removal suite. My advice to anyone wishing to play this version of Steel City Vault is to goldfish some matches, and to learn all of the Goblin Welder tricks this deck can use. This deck wants to goldfish even with a live opponent, it isn't built with much disruption. Decks like TPS play Forces, Missteps, and even Duress to ram through their combo. Compare that to the four counters in Steel City, and you can see what I mean. Playing the deck is much like piloting storm decks. You've got to make sure you're counting mana and cards correctly. Consider your lines carefully and try to soul-read the contents of your opponent's hands. Saving up several must-counter cards is often the way to go. 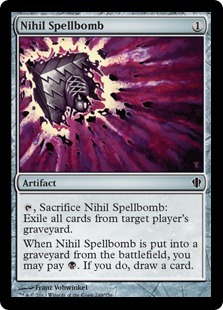 This allows you to make the opponent waste all of their Force of Wills until finally one important bomb resolves. Draw7s add a ton of variance to your games. Always check your opponent's graveyard and exile zone to be sure how many counters they are likely to have left. Chances are, if they let a Wheel of Fortune resolve, then they weren't holding Force. If you see one or fewer Forces in the opponent's graveyard, then it is very likely that the Wheel or Jar drew them into a few counters. I use Burning Wish to get a win condition quite a bit. 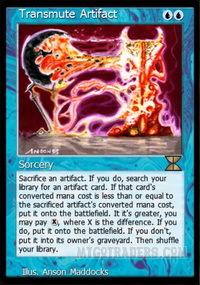 Generating a lethal Tendrils of Agony isn't hard with all of the free artifacts and cheap card-draw. If you can Hurkyl's Recall yourself during your storm-turn, it ensures that you will have lethal storm. Besides Tendrils, I've Wished for Balance to either catch me back up or to Mind Twist my opponent. I haven't Wished for Mind Twist itself yet, but there's a first time for everything. 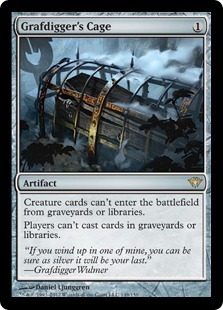 Steel City Vault is a powerful deck, and a ton of fun to play. It has its shortcomings, but in the right hands it can do some absurdly busted things! I'm going to be working on Steel City Vault quite a bit in the near future. I absolutely love the deck, and I feel like I can tune it into something that I'll do well with. If you can afford the cards, I'd recommend this deck to you in a heartbeat. There's another version of Steel City that I'm interested in trying. 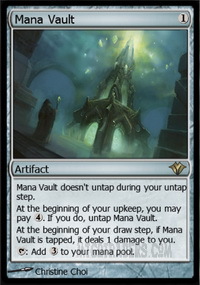 That deck is referred to as Angel City Vault, and it was developed by Danny Batterman. 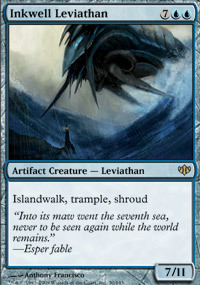 His list runs a main-deck Inkwell Leviathan, as well as more Counterspells and a Jace. It's going to take some work for me to get the two Misdirections his list plays in the main deck, but I think that it's worth it. On fairness, variance, and reinventing the wheel. Vintage is a fickle beast. It's a high-variance format by nature due to the Restricted List. Because of this, it is entirely possible to have a win snatched away from you by an unexpected and highly unlikely string of broken plays by your opponent. A back-breaking Yawgmoth's Will victory can create a lot of feel-bad moments. There's another way to look at this though. These Vintage blow-outs are a two-way street! It could just as easily be you playing Time Vault and Voltaic Key on turn one with Black Lotus mana. Anyone can play those cards if they want. This is especially true on Magic Online, where a Vintage Masters Time Vault will run you a whopping forty-eight cents on MTGOTraders.com! Broken decks with high numbers of restricted cards are also much less consistent. If you choose to play a "fair" deck like U/R Delver or Stax, you are essentially trading away the ability to have broken combo turns in order to gain a significantly higher level of consistency. It's your choice to make, but please don't begrudge someone else for playing something that you decide is "unfair". 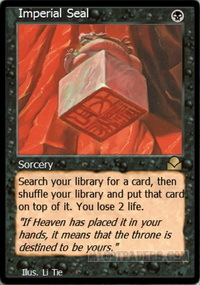 And while I'm at it, I'd like to address the idea of "fair" and "unfair" as it pertains to Magic: the Gathering. For starters, Magic itself is inherently unfair. 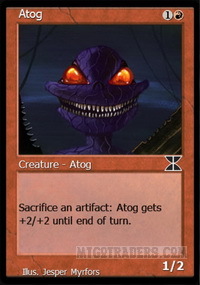 Tarmogoyf is better than Squire or Grizzly Bears. 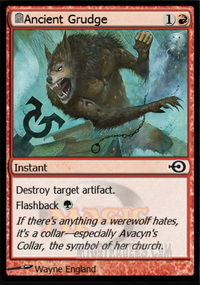 To the bears, ol' Goyf must seem to be the most unfair of all. Of course, that is just a silly example, but I think it illustrates my point. As "Spikes" we want Lightning Bolts, not Shocks. We as players are meant to explore this game and to choose the best cards for our decks. The best cards just happen to be ones that can allow us to leverage an advantage over our opponent. 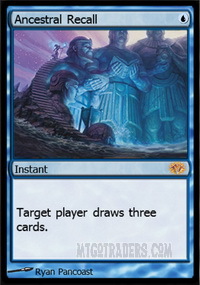 I mean, if our cards didn't allow us to gain an advantage, every single match of Magic would be either a giant board stall, or simply be decided by who drew more gas (non-lands). That sounds like an awful experience to me. Play what you love, love what you play, and I sincerely hope that what you love ends up being Vintage or Legacy. Net-deck like a champ, or brew your own Frankenstein's Monster, but please don't hate on the other guy who made the opposite choice. You wouldn't criticize a pilot that couldn't build their own jet, so why would you bother ripping on someone for playing someone else's deck? That's all the time I have for this week. Until next week, stay calm and don't waste that Force of Will! Click the Eternal Spotlight logo to be directed to my article library. Thanks for reading pic links to my Twitter page. I'd like to thank MTGOTraders for supporting my writing, and Jeremy Muir for teaching me how to be not terrible at Magic. as always, great job man. Reading your articles help lift the veil of vintage for me every week. It's a cutthroat, insane and fairly expensive format, so to try to break into it without any knowledge of it is nigh impossible, but your articles highlight decks while still discussing all the other relevant decks in vintage due to your featured-deck's matchups. After consistently reading these articles for a couple month, the picture of what vintage is is ever more clearer. Though I have not popped my tournament-level vintage cherry on MTGO, I feel like your articles are preparing me for that eventual day in a way that I don't feel like I'm being talked over, or down to, but simply at. Thank you very much. I certainly hope that I don't ever seem like I talk down to anyone! I'm certainly no better than anyone else. I would love to see you start playing vintage. At some point, i'm going to do an article on some cheaper decks for aspiring vintage players. And I recommend building an established deck, learning it, and then tuning it or brewing. That way you know what ia going on. I just love the enthusiasm you put into your writing. Every time I finish reading one of your articles I want to try out the deck you showcase. Keep up the great work, and thanks for the games last night. Seriously, I'm feeling more comfortable with Oath now that I've chatted with you during our matches. Thank you! I think with some decks, the way they play out, people damage each other with creatures and whatnot, so the games seem closer. If you won 50% of your matches, and every game had the winning player down to a low life total, then the assumption would be that both decks were working. With Oath (your build), you're either going to resolve Oath/Griselbrand or Key/Vault or lose. The chances of winning with a Jace alone are slim. So, a close game is one where you almost resolved Oath but were one Flusterstorm short. Or perhaps you did resolve Oath, but they Abrupt Decay'ed it and when you Misdirected it that got countered or something. You may lose a match with your opponent at a high life total, but that doesn't mean the game wasn't "close". The first Vintage Daily I played in, I was undefeated until round three. I played against BUG Fish, and I lost game one, won game two with a very strong hand. Game three, I don't remember everything I may have done wrong, but I do remember I played a Mana Crypt way too early and ended up losing the majority of my life lost to that crypt. So, little tricks like that add up. 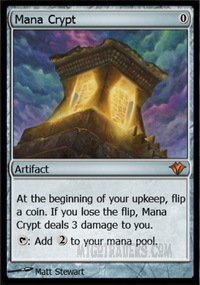 I've seen a ton of people lose to their own Mana Crypt because they played it way too soon. It's a dangerous card if you don't have a very clear path to victory when you play it. One more thing, Misdirection is worth it. Greg Fenton even made a list for people to use that had two of them in it! Why? Abrupt Decay. If you manage to get one or two (one is ok for now), don't waste it either. 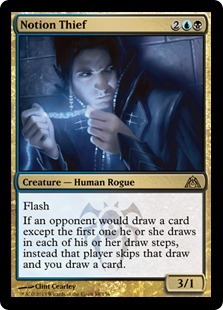 Redirecting Abrupt Decay or a removal spell targeting Oath is too important to waste it greedily by stealing an Ancestral Recall (like I've done). Thanks for reading man, I'm glad you enjoyed it!